Creatine is probably the most studied and widely used sports supplement in history, and with good reason. If there were ever a single supplement that had the hugest impact in the fitness industry, creatine would be it. Creatine makes you leaner, increases your work performance, shortens recovery time and helps you achieve your training goals even faster. Unfortunately, there are a lot of myths surrounding creatine. For instance, there’s been heated debate around on the topic of women and creatine supplements, and whether women should use them or not. Some websites claim that creatine supplements makes women look masculine, gain weight and feel bloated. These misconception may be due to the fact that women lack natural testosterone needed to bulk up while using creatine. Well, ignore all those rumors as they’re unsubstantiated. A good number of female pro athletes use creatine because they know the benefits accrued from it. The fact is that creatine impacts your performance and supports muscular endurance to allow you to push out more reps. Other benefits you can enjoy include increased energy, faster recovery after workouts, prevention of heart failure, muscle growth, less fat, and the list goes on. Creatine is created in the body naturally and can be found in some foods like beef, chicken and fish. The problem is that such foods have small concentrations of creatine, and your body needs more. With each passing day, the number of manufacturers producing creatine supplements increases. For this reason, you have to be cautious with the product you buy. That’s what this article is all about – giving you the best creatine supplement choices exclusively for women for the most reliable and best performance. We took into account quality, value and cost. 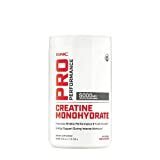 In the conversation of the most popular sports supplement among both pro and amateur female athletes, GNC Pro Performance Creatine Monohydrate, Unflavored stands out from the crowd. 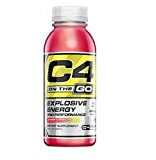 For a supplement that gives you a burst of energy to tackle even the hardest of workouts, this is the best. GNC Pro Performance Creatine helps you increase your strength and rapidly recover after workouts. This supplement comes in an unflavored powder and is quick and to dissolve in any drink of your choice. The supplement may not be the cheapest one in our list, but every dollar spent on it is worth it. One tub gets you 100 servings. A tub sees you through a number of daily workouts and can last for months. For those allergic to gluten, feel free to use it. GNC Pro Performance Creatine’s dosage is one teaspoon for 8-10 ounces of your preferred drink and you’re good to go. Creatine is known to cause dehydration so make sure you have water with you to keep yourself hydrated throughout the day. In terms of performance, this is our top choice. 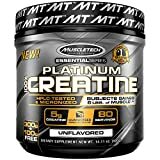 Second on our list is the MuscleTech Platinum Creatine Monohydrate Powder. For a reasonably low price, this supplement beats many other creatine supplements when it comes to performance. You get 80 servings with it that could last you a couple of workouts. Its unflavored version is recommended for people who are not big fans of flavors and added sugars. This supplement is 100 percent monohydrate creatine, the most researched creatine powder. Hope its scientific superiority makes you feel safe about its usage. On top of that, the supplement’s performance is relatively quick. Heavy lifting trainers built 6 pounds of lean muscles in 6 weeks. Other users increased their strength by 18.6 percent in just 10 days. This is proof enough of its high performance. Other benefits include building muscles, increasing strength and a enhancing quick recovery. We give a thumbs up to this product for its affordable price and a high performance, features that make it appear on our list. For people under restricted diets and supplements, the Creatine Monohydrate Powder Micronized by BulkSupplements will work for you. It is not only sugar, soy, gluten and yeast-free but also vegan-friendly. The supplement improves athletes’ performance, builds their strength and also increases the size of their muscles. These features make it suitable for female bodybuilders and powerlifters. BulkSupplements lab-test all their products for high standards and quality. They assure their customers the best performance and recommend it as a starter supplement. This supplement can be mixed into your favorite drink be it juice, milkshake or water. For best results, take it half an hour before working out. The percentage of 5-star ratings on Amazon.com is an indication of how much customers were satisfied with its performance. One customer, a cyclist, was impressed by the little quantity you have to use; even making its smallest package, the 250 g package last quite a long time. 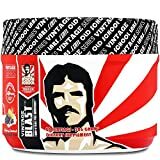 This supplement, unlike others, is made by blending three types of creatine; creatine monohydrate, creatine alpha-ketoglutarate, and creatine pyruvate. The unique formula provides a higher recovery time making you continue with your daily chores even after a heavy workout the day before. Whether you are a bodybuilder, powerlifter or an endurance runner, this supplement will propel your performance real quick. Most users prefer pills to powder. Carrying them along is easy without having to worry that they might spill out like powder and make a mess in your bag not to mention the loss you’ll undergo. A bottle of this supplement contains 90 capsules, so you are assured of months usage. Customers’ positive reviews are evidence of its performance, with many praising it for boosting them out with little time as two weeks. For female athletes who are satisfied with their performance but want to bulk up a little, we recommend to you the Crazy Muscle Creatine Monohydrate Pills. Our last supplement targets people with diabetes. Research suggests that creatine can help people with type 2 diabetes. This is through improving the sensitivity of insulin, controlling glycemic and enhancing the intake of glucose by the cells. At last, hope is there for diabetic people, and this has psyched them up to start using creatine. However, you ought to consult with your doctor first before starting using any supplement. If they give you a heads up, we recommend the MET-Rx® Creatine Monohydrate Powder. 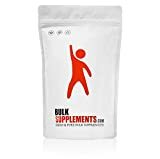 Made without any artificial sweeteners, flavors or colors, this supplement is pure creatine that rapidly increases your strength and muscle growth. A reviewer, who has diabetes, added points to it for being easy to mix and also being able to meet their needs. It is not until recently that weightlifting stopped being considered as a male sport. After careful research and test, our team compiled the above-listed best creatine supplements for women. The supplements are effective and their effects are noticeable within short periods. They are made to accommodate different people: the diabetic, vegans and people under restricted diets and lifestyles. Basically, there is something for all in this guide. Most of these supplements have low intake and could last you a couple of months. They are available on Amazon.com for purchase and shipping.